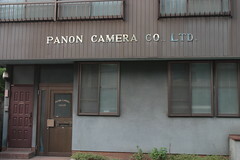 Panon Camera Shoko was a small-scale Japanese camera manufacturer, founded by Nakayama Shozo in 1952. The company is best known as the maker of the Widelux panoramic cameras. The Widelux, as well as its predecessor the Panon, uses a lens which swivels through a horizontal arc, projecting an image onto a cylindrical film gate. The principle is similar to the Kodak Panoram series, begun in 1899, and was emulated by Horizont (for 135 format) and Noblex cameras (for 120 format). 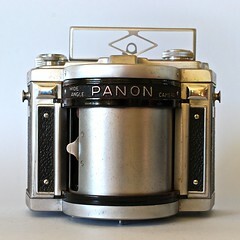 Panon was the name of the company's original 1952 panoramic camera for 120 film. 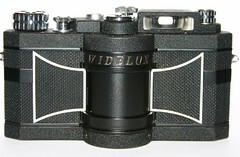 In 1958 the company introduced the Widelux FV which used 35mm film (135), and which underwent various model upgrades (last model F8, ceased production about 2000). In 1987 Panon resumed offering a model for 120 film, the Widelux 1500, but production was ended when the factory suffered a fire in the mid 1990s. The company shut its doors in about 2005. Panon AIII (1953, Jun), with Panon f/2.8 50mm Variants known. ↑ Paxox offered for sale at the 28th Camera Auction by Westlicht Photographica Auction, on 21 November 2015; several excellent pictures of the camera. This page was last edited on 2 November 2015, at 21:05.